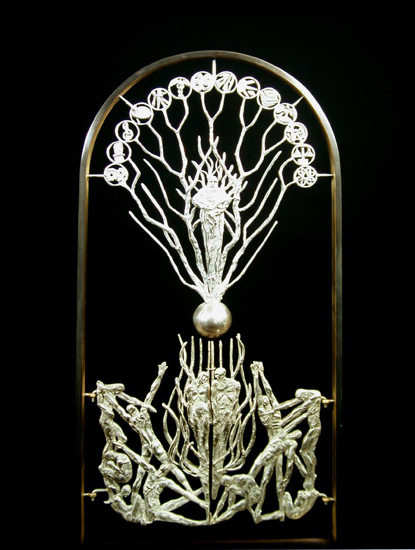 Envisioned as an entrance to a library or school, this pieces expresses a metaphorical transition out of the horrors of the holocaust as reflected by the lower figures and united by the couple in the center, representing Adam and Eve. These figures are the seeds that blossom into all the wonderful areas of learning, a spectra of subjects ranging from math, science, astronomy, to literature, music, and art. Symbolizes the rich contributions made by the Jewish people throughout history. The contorted figures of the gate represent the angst of the holocaust and are united by the center figures of Adam and Eve whose seed flowers into the fourteen scholarly disciplines, the arching fruits of the trees of life. The branches radiate out from a central rabbinic figure who is reading Scriptures to a child.